It’s not easy to place Alessandra Salituri’s loft at first glance. Is it in Paris? The elegant French doors and curated art collection certainly suggest so. Or perhaps it’s nestled in Manhattan: The warehouse ceiling and industrial windows could belong in SoHo or TriBeCa. Salituri, an art dealer, interior stylist, and founder of online gallery Citizen Atelier, admits both were the inspiration for her elegant loft in Montréal. “Born and raised in Montréal, I love a European-inspired aesthetic and always dreamed of living in a Parisian-type loft in the heart of the Old Port,” she tells MyDomaine. The one-bedroom apartment has character in spades—it’s one of several rental apartments designed and owned by Nathalie Bouchard and Annie Horth of Creative Flats. Originally built in 1912, the 10-floor Unity building in Montreal’s Paper Hill is now considered a historic monument. 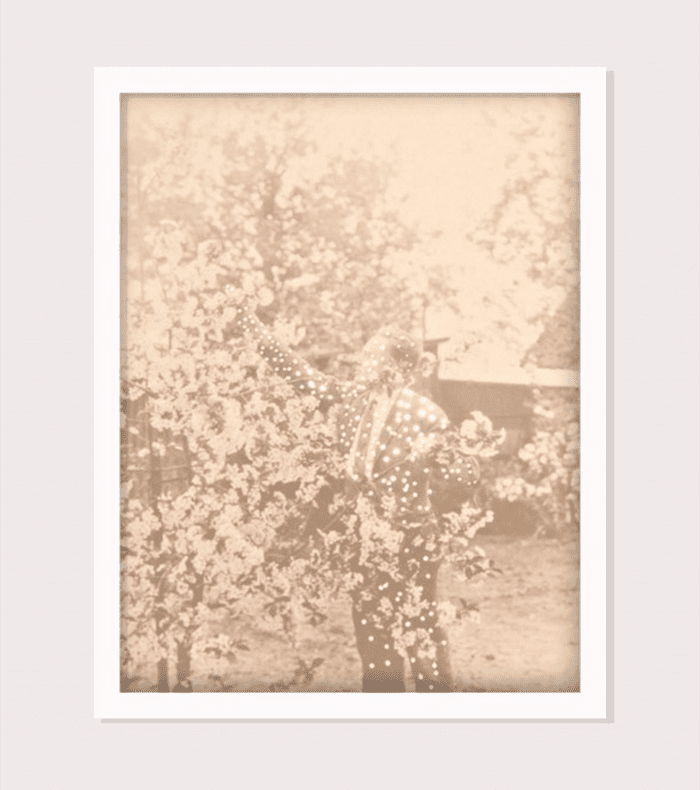 While much of the design and styling is the work of Bouchard and Horth, Salituri’s expertise put her in a unique position to add her own touch via art from her online gallery. Take a peek inside this Paris-meets-NYC loft for a lesson in styling. Though many design elements imbue the space with that French je ne sais quoi, few are as impactful as the grand custom double French doors—a favorite of both Salituri and Bouchard. “My favorite thing about the space was undoubtedly the double-sided white doors with hand-carved moldings. It gave the loft such a European-inspired touch,” says Salituri. It was certainly worth the effort though. The finished apartment looks both sophisticated and European—“a sort of Paris-meets–New York type loft with 11-foot tall floor-to-ceiling windows, an open-concept design, and exposed pipe ceilings,” describes Salituri. The apartment mightn’t be expansive, but smart renovation and styling choices make it look and feel much bigger than it is. “Although the place is 780 square feet, the natural light and open concept floor plan create a spacious effect throughout,” says Salituri. Every nook counts, including a stretch of blank wall that’s been styled as a mini home office. 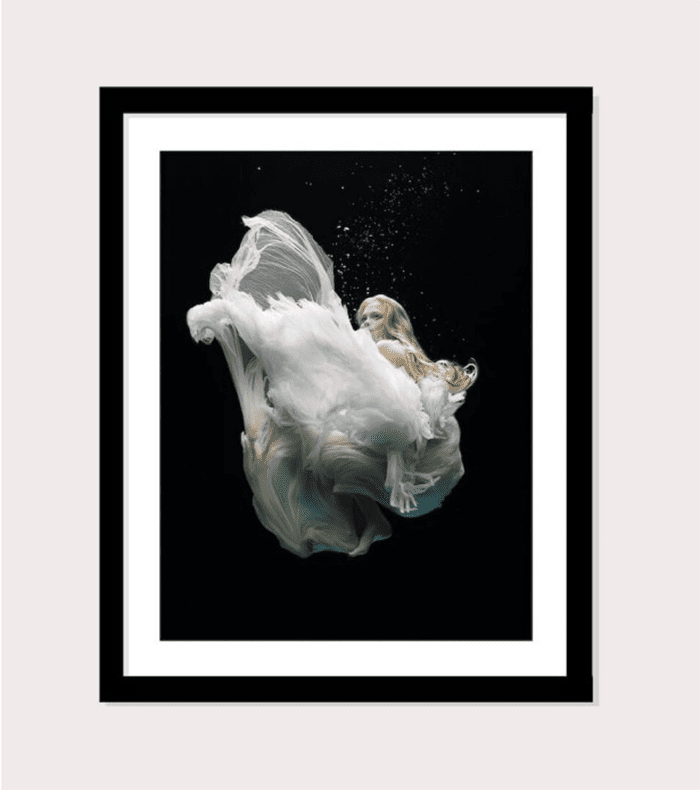 A statement Zena Holloway underwater Angel print defines the desk area as its own space. “I’ve always felt that art is that one unique and personalized element that should lift you up and inspire you to live your best life,” she says. The living room gallery wall is certainly curated with an art dealer’s eye for color and composition. “I’ve always been attracted to feminine, surrealist, and slightly moody art that makes you dream,” she explains. 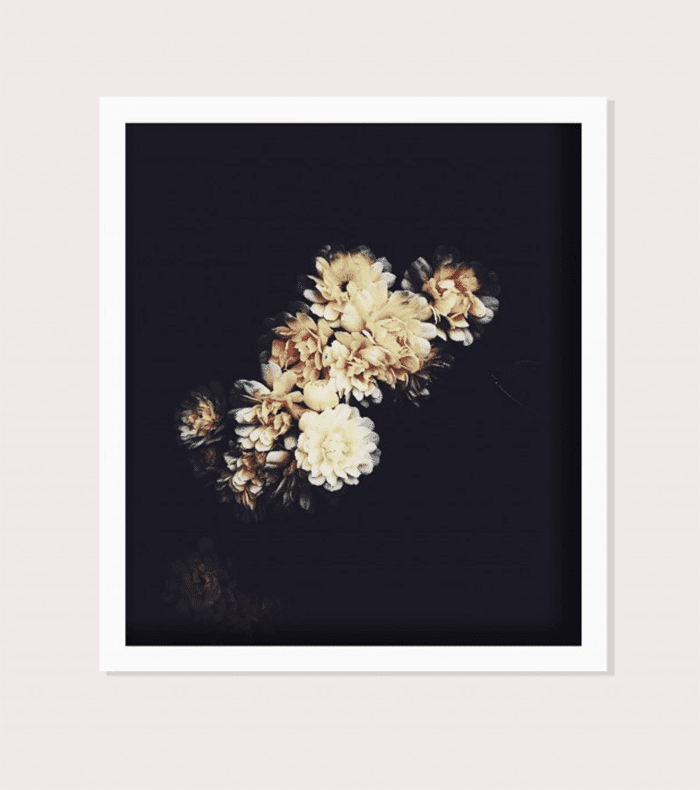 “I selected pieces from my gallery that played off the light and dark elements of the space and kept within the monochromatic palette.” Two of which are Ashley Woodson Bailey floral prints—her favorites in the room. Perhaps one of the reasons she was drawn to the apartment was the statement furniture, including the toffee-colored upholstered sofa in the living room. “[One of my] favorite elements in the space is the beautiful vintage chesterfield sofa,” she says, accessorizing the rest of the living room around that statement piece. “The first thing I bought for the space was an array of artistic coffee table books,” she says, scattered on the industrial-style coffee table. The brooding bistro-style kitchen and dining room area is a definite feature of the home. Matte charcoal paint creates a sharp, ambient space while vintage elements like the fruit stand and chandelier from Avant-Scène strike a unique silhouette. “We kept the original kitchen that was already there,” says Bouchard of the extensive renovations. “We refreshed it with new Carrara marble counters and a backsplash, and had the façades powder coat–painted in anthracite,” as well as custom building a closet and sliding doors to hide the fridge and washer/dryer. There’s no doubt it’s an apartment characterized by contrast—beyond the French-meets–New York styling, there’s also a distinct black-and-white color palette. “The color scheme was kept very high-contrast and monochromatic with the black velvet curtains, deep green Chesterfield sofa, white floors and moldings as well as the checkered kitchen floor,” Bouchard explains. Softened with natural wood elements, textured ceramics, and art, it’s certainly the perfect mix. Loved this French girl–inspired home? Here are seven lessons we’ve learned from the Parisian approach to decorating.